The biggest problem with wind damaged shingles is that from the ground, it is difficult to tell that the damage is there. Sometimes damage is obvious because shingles or sections of shingles are missing, but most of the time it is difficult to find. During a high wind, each individual shingle can be lifted away from the shingle below, and water can be blown in under them. Once the wind stops, they often lay back down showing no visible damage at all. An on-roof inspection is the only real way to determine whether or not your roof is damaged past the ability to be repaired, and whether or not you should replace it. Once a shingle has been lifted by high wind, it will be much easier for smaller wind to lift it, and indeed much easier for water to be blown under them and into your home. It is just a matter of time before leaks begin to show and your roof should be replaced as soon as possible. 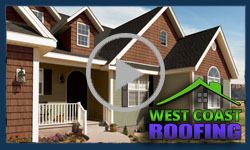 At West Coast Roofing in Portland, our job is to make sure that your home is protected by ensuring that your roof is in the best shape it can be. Call us today for an assessment of your roof and we will be happy to take a look.